I was praying in the garden when a butterfly came playfully into view. Fluttering back and forth, alighting here and there, then taking off again. I have been awakened to the value of native plants and have worked steadily over the past few years to increase the bio-diversity of plants, especially natives, and to delight in the varieties of insects and birds that have come to enjoy the space. 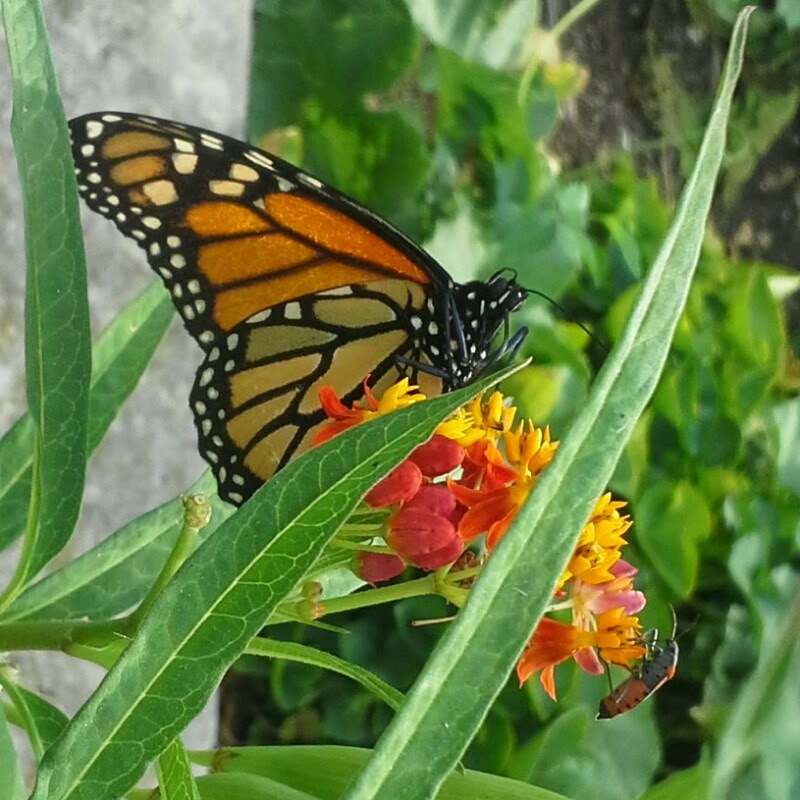 Both the city of St. Louis and my own community have been supporting these efforts, and the picture at the right is a photo of a monarch on one of the milkweeds that I planted to this year. The other, less-showy insect is the milkweed beetle, I have had lots of them too, as well as milkweed aphids earlier in the summer. I got my camera and took up a position near the milkweed plant and waited for the Monarch to settle on a plant within camera shot. She went from one milkweed to the next, but only the Asclepias curissavica is in bloom, so she settled there to have a meal. Many monarchs have come over the summer to get some nectar. I have seen them around from time to time. This morning I felt particularly blessed to witness this visitor. Her presence witnesses to the fact that the ecosystem is coming back to life. How many other miracles are blossoming in my life, in my community, in my neighborhood? It is a privilege to stop and notice the blessings as they unfold in this place. I am also in dialogue with sisters who are interested in joining this community. Together we create the ecosystem that will foster our life and the nourishment of Gospel living among us and around us. How to I know where to go? Where God is calling? Where to walk? Where to put my hands in service? What words will bring healing, hope, life? In the big and little moments of life, I ask these questions, in the context of prayer and a gentle contemplative presence. In my own prayer-space, in my heart, in my relationship with God, I come to an understanding of my call and vocation. In community, we also come to places of knowing where God is calling us as a group. It is a matter of listening to the still small voice within my own heart, and sitting with my sisters and brothers as together we wait on the movements of the spirit. When the time is right, I find words to speak the truth that I know, and I wait for others to find words to express their own experience of discernment, of listening to the voice of God. I just returned from spending a few days at the LCWR assembly in Nashville TN. It was a great opportunity to connect with women religious from around the country and to engage with them as we reflect together on religious life as the gift we receive and the gift we share with those among whom we live and work. I rejoice in the great tradition even as we face difficult challenges in these days. Carol Zinn reflected on the melody, rhythm and silences of our lives. Her address resonated with me in the desire for vibrant community that also relates to other circles of community and gifts of mutuality. The video in the last blog post has continued to resonate with me. In the garden, the soil, plants, insects and birds are all in dynamic relationship with one another, in circles and networks of community. Then we live in community with the plants nourishing and being nourished by the plants, by the fruits and veggies, and also by the beauty of flowers and plants. Our ecosystem is located in the eco-village where we work together for sustainability and work to build the neighborhood. Community is happening at so many levels. Just as music has melody, rhythm and silences that enhance one another, so each of our lives come together in a lovely song that comes forth from Holy Mystery Revealed in our Midst. Community happens at so many levels and in so many networks. 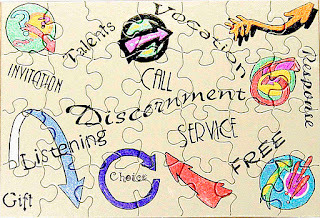 Imagine community with sisters from various communities, living, working and praying together. Imagine living sustainably in an urban setting. Imagine living in dynamic relationship with Earth and the ecosystem. Imagine networking with others in neighborhood ecovillage. Imagine incarnating the Gospel here and now, in our lives today.